VecTor4 is a nonlinear finite element analysis (NLFEA) program dedicated to the analysis of three-dimensional reinforced concrete planar continuum structures. Typical applications include the analysis of reinforced concrete shells, slabs, and walls subjected to quasi-static or dynamic loading conditions. While originally formulated for the analysis of reinforced concrete structures, several continuum material types (concrete, FRC, steel plate, etc.) and reinforcement material types (mild steel, prestressing steel, FRP, steel plate, SMA, etc.) may be considered using built-in material models. 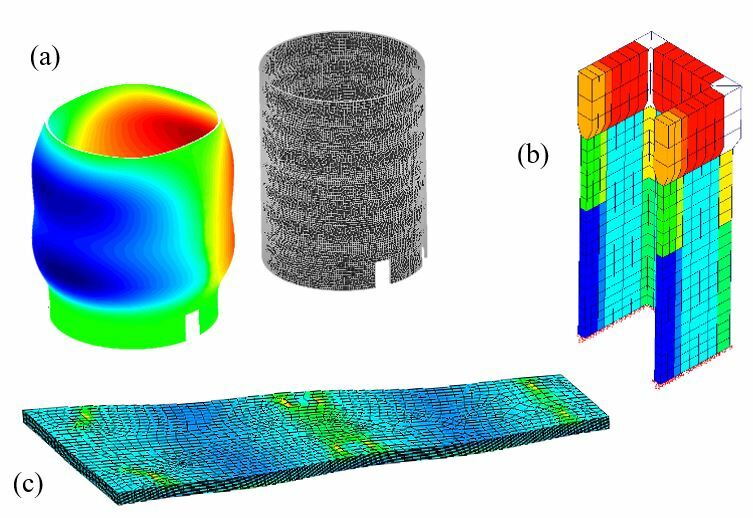 VecTor4 employs cracked reinforced concrete material modeling done using a three-dimensional smeared, rotating crack procedure, in accordance with the formulations of the Disturbed Stress Field Model and the Modified Compression Field Theory. The analysis procedure inherently considers the redistribution of internal forces that can occur due to local changes in stiffness arising from concrete cracking or crushing, yielding of reinforcement, the influence of variable and changing crack widths (including slip deformations along crack surfaces), the presence of multiaxial stress conditions, and various second-order mechanisms that often contribute significantly to the response of reinforced concrete structures. The program’s solution algorithm is based on a total load, secant stiffness, formulation permitting stable performance and good convergence characteristics for a broad range of response conditions, including those governed by brittle concrete failure mechanisms. The program employs high-order shell elements (9-node, 42 d.o.f.) that can be used to represent structures possessing irregular or curvilinear geometries. The use of a layered thick-shell element formulation allows for stiffness variations through the thickness of the element arising from different material types or material nonlinearity to be represented discretely through the thickness and permits analyses involving in-plane or out-of-plane loading conditions. Thus, unlike many other analysis programs that require the use of three-dimensional solid continuum models which are expensive in terms of preparation and computation, the layered procedure used by VecTor4 can capture shell structure response (including through-thickness shear-governed failures) using simple finite element modeling techniques requiring reduced computational effort. Other available element types include a 2-node (6 d.o.f.) truss bar element which may be used for discrete reinforcement modelling. However, a key feature of VecTor4 is that most reinforcement may be modelled using smeared techniques: out-of-plane reinforcement can be modelled as a smeared property of the shell element and in-plane reinforcement can be treated as an additional layer/fiber located over the depth of the layered shell element. The smeared reinforcement representation in place if discrete rebar definition greatly simplifies the model construction process. Special analysis functions include facilities to consider element erosion, cover spalling, ASR expansion and material deterioration, and the effects of fatigue and corrosion. Stochastic analyses can also be performed using Monte Carlo, Latin Hypercube or Correlated Field simulations. Sample VecTor4 Analysis Applications: (a) reinforced concrete storage silo (mesh and deformed shaped under uniform storage load); (b) U-shaped reinforced concrete core wall; (c) irregular reinforced concrete flat plate (mesh, deformed shape and out-of-plane shear strain contour under uniform gravity loading).